Casio America (booth 1131) is showcasing its latest projection technology along with other solutions at the Digital Signage Expo. Among these is its line of LampFree projectors, which are positioned as a versatile, eco-friendly, and durable product line for education and corporate clients. Casio’s LampFree lineup combines a laser and LED light source to create a high-brightness, mercury-free tool that uses half the amount of power per unit than other lamp-based projectors, according to the company. The projectors reach maximum brightness in as fast as eight seconds from the time the power is switched on and can immediately power off, then be used again right away, without the need for a cool-down period. 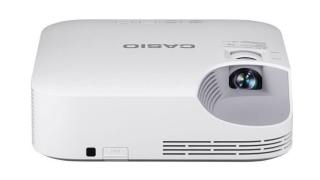 In addition to showcasing its projectors, Casio will also highlight use cases for its technology. Working with Glass-Media (booth 1936), Casio will demonstrate a projection-based digital storefront. Designed and developed for a range of uses including retail, convenience, QSR, hospitality services, and more, the new projection-based digital storefront helps brick-and-mortar retailers boost store traffic, build brand awareness, and increase both engagement and conversion. Glass-Media utilizes both the Casio XJ-V10X and the Casio XJ-V110W LampFree projectors that provide up to 20,000 hours of continuous use. These storefront solutions will be shown at both the Casio and Glass-Media booths.